Sandy beaches, dunes and sea-cedars! At the southeastern edge of the Laconian Gulf a small island stretches its great sandy beaches with dunes and sea-cedars. Elafonisos! Its name means the “island of deer” and there is a reason for this. Hospitable and beautiful, with leeward bays, Elafonisos offers a calm and easy life for good vacations in a wonderful sea environment. Just a step from the Laconian coast! Elafonisos is located on the southeastern side of Laconia, too close to the coast. Its northern point is 570 meters far from the opposite point in Pounta. In a small distance is the tiny island of Pavlopetri with archeological findings. On the eastern coast of Elafonisos is formed the Lephke bay. In front is opened the greater bay of Neapolis. The distance from the harbor of Neapolis on the east is 3, 7 nautical miles. 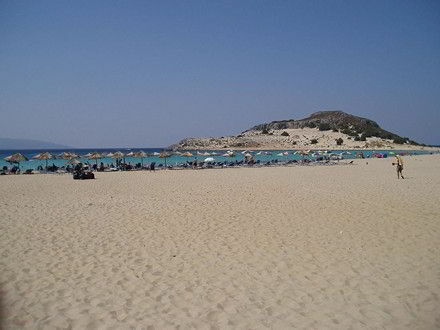 The whole southern coast is a bay; the Sarakeniko bay, with the famous sandy beach of Simos. 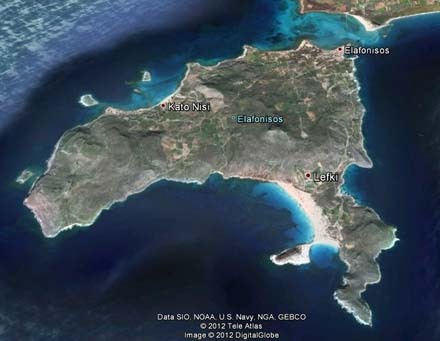 Between the southeastern edge, the cape of Frangos, and the northern point of the island of Kythera in south is extended with 4,5 nautical miles in width the Strait of Elafonisos, an important passage for the ships from the ancient times. On the western coast are four islets; Kassella, Poria, Leptonessi and Aelyphtes. The sandy beach is called the Nessia of Panagia (Islands of Virgin Mary) because of the church in the region. 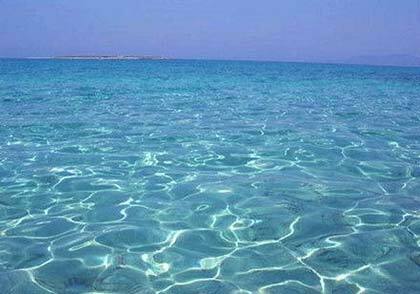 Elafonisos, or Laphonessi as is called by its fishermen, has an area of 19 sq km in a triangular shape. Its length is 6, 5 km and its width 4, 5 km. It has a coastline of 26 km long. The highest hill is Vardia at 267 meters. During the antiquity it was not an island but a peninsula linked to the main land by an isthmus. In 375 AC after a powerful earthquake a city was submerged near the islet Pavlopetri and the isthmus was covered by the sea. That’s how the peninsula became an island. Elafonisos numbers 750 inhabitants. 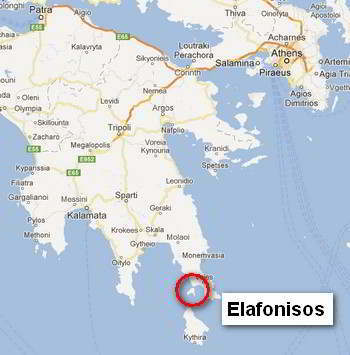 Until the 1980’s all the people at that time lived in one village, also named Elafonisos, on the northern coast. Gradually other settlements were created; the small Kapari, the greater Kato Nessi in the west beach of Panagia and later Lephke. On the opposite is the small settlement of Pounta with the port for the crossing. In the 1980’s the island was a paradise for the fans of free camping. Year by year the tourist interest increased. Now-days during the summer the inhabitants are double. During July and August the average of the tourists per day is more than 5.000. We can go to Elafonisos by road or by sea. By road we follow the national road from Sparta to the south and on the right point we take the direction to Molai on the east and then south to Neapolis, at 132 km from Sparta. Before Neapolis a fork leads to the dock of Pounta, from where small boats and ferries pass in a few minutes to Elafonisos. We can also take the bus from Athens or Sparta to Neapolis (KTEL of Laconia). By sea we can take from Piraeus the ferry to South Peloponnese, Kythera, Crete or the ferry connecting Neapolis, Elafonisos and Kythera. The trip from Neapolis lasts thirty minutes. There are also boats connecting Neapolis, Lephke and Elafonisos. There is always the possibility of changes or new connections, so it’s better to ask making our plans. From the city and port of Elafonessos a road follows the eastern coast to the Lephke bay at the middle and the famous Simos beach on the south at a distance of 4 km. During the summer tourist boats from Elafonisos or Neapolis make the route. Another road from the port leads to the Nessia of Panagia beach at about 4 km on the western coast. There is also the possibility of taking a tourist boat. In the ancient time the peninsula named from its shape Όνου Γνάθος, “Donkey’s Jawbone”, as refers Pafssanias, the great traveler of the 2nd Century AC, in his work about Laconia. 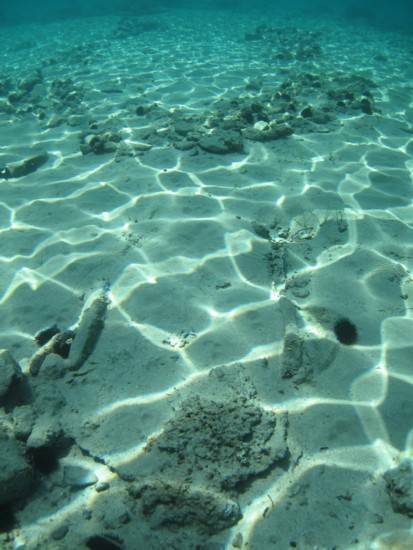 He says that there was a city, apparently the one submerged during the earthquake in 375 AC, and he refers the tomb of Kinades, the captain of the boat of Menelaus, King of Sparta. 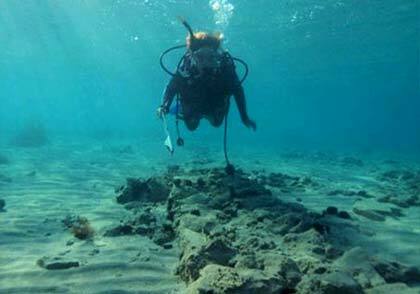 The remains of the city and tracks of coach-roads can be seen in the bottom of the sea near the islet Pavlopetri. Tracks are also distinguished on the coast of Pounta, at the cape Kalogeras west of the port of Elafonisos and in other points. According to Pafssanias in the peninsula were sanctuaries of Artemis (Diana) and lived many small red color deer. A statue, found in the region and admired in Louvre museum in Paris, depicts the goddess holding such a deer. In the Greek language “deer” means “elaphos”. There were deer for a long time, even when the Venetians came, so the island named Elafonisos. Elafonisos was uninhabited. In the 7th Century the Byzantians built a castle, destroyed in the 9th Century by the Sarakins pirates of Arab origin who infested the Aegean Sea. Then as elsewhere came the Venetians and then the Turks. Three sea-fights took place between them around the island. Venetian charts of 15th Century name the island as Cervi and the island of Kythera as Cerigo. In Kythera the locals still call it Tsirigo. In the 16th and 17th Century Elafonisos was an important pirate base. 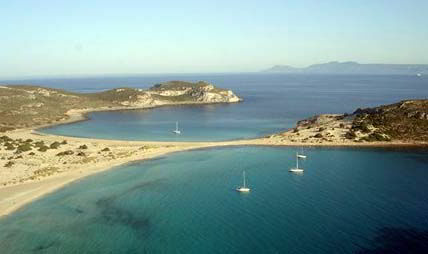 The sandy beaches, especially the Sarakiniko bay on the south, offered good place of refuge and mooring the boats. But the most important reason was the situation of the island. The Strait of Elafonisos was and still is a main passage for the ships. Then came the French and then the English. From 1814 until 1864 England ruled the Ionian Islands, including Kythera, Antikythera and Elafonisos. But Elafonisos was not mentioned in any treaty. So after the Greek Revolution in 1821 and then the proclamation of the Greek State, the island was included in Greece. Some efforts to be inhabited failed and a little later England demanded it back. The residents of the region around brought sheep and goats on the island as a proof that it was used. After a long diplomatic conflict, the problem resolved in 1850. Greece had to pay 340.000 drachmas and the island was now in the Creek territory. The was inhabited. There was another reason for this. The same year the piracy definitively terminated by the Greek Navy. It’s not by accident that the settlement of Elafonisos is located nearby the sea and not on a hill in the interior as the most central settlements on the other islands. Besides, from that year the island houses began to be whitewashed. Until then they kept the color of the environment. Pounta is under Elafonisos’ administration, although is located on the opposite coast. Its sandy beach is one of the most beautiful of the region; the sand is thin and the waters shallow. It was much longer, but it lost a part of its length because of displacements of the sand around the coast. For the same reason the small harbor removed. For years and years the distance was about 350 meters and the flat boats and small ferries took six minutes crossing the shallow cannel. In a few years the distance changed at 570 meters. Some more minutes for the crossing! 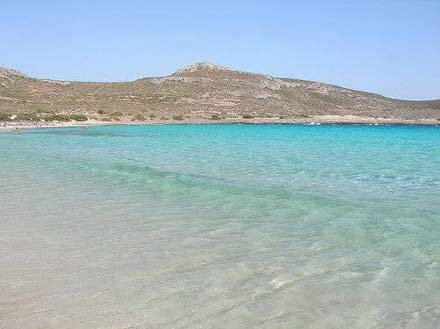 About 800 meters east of Pounta is another beautiful sandy beach; Pavlopetri! It got also shorter the last years for the same reason. In the region are traces of the coach-roads leading to the ancient peninsula. On the coast Mycenaean tombs are discovered; ancient tombs are also found on the islet Pavlopetri or Petri, one step from the coast. The waters are shallower after the “plays” of the sand and some prefer to pass by foot instead of swimming. Northeast of the islet, in a small distance, the remains of the ancient city can be seen at the bottom. The small city of Elafonisos is located on the northeastern side of the island. The old port is picturesque with fishing boats rocking in the water. 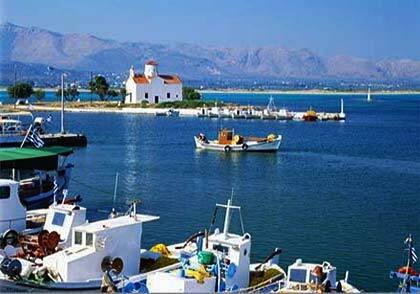 Elafonisos has a long tradition in fishery and a great number of fishing boats, one of the greater all over Greece. The fans of fishing will find a lot of places around the coasts for their hobby. Approaching from Pounta first says “welcome” the church of Aghios Spyridon. Along the coast road are fish-taverns with fresh fishes, delicious bouillabaisse and octopus; also “ouzeri” with ouzo and “meze”, that is various but nice sort of food. On the southeastern side is formed the bay Megalo Tegani (Big Frying-pan), where before was the beach of the village and now is the new port. Near is the small church of Aghios Ioannis (St. John). There are hotels and, mostly, rooms to let; also restaurants and solutions for fast food, super markets and bakeries for the shopping, shops with traditional products and sweets and tourist shops. West, near to the settlement, is the Kontogoni beach and a little further the Kalogeras beach with dunes and sea-cedars. East of the port the road follows the eastern coast of the island to the south. At the middle a wonderful bay is formed. Lephke! Calm even if the southern or southwestern winds blow. The sandy beach, not so long but beautiful, and the water with incredible colors make part of an enchanting landscape. On the southeastern edge of the island is formed the Frangos bay. Its mouth stares the island of Kythera at the south. Next is another bay; greater, up to the southwestern cape! It is Sarakeniko, the old pirate base! Amazing! A narrow piece of land separates the two bays and connects the sandy beach on both sides, with high dunes and sea-cedars. It is the famous Simos beach, one of the most beautiful beaches in Mediterranean Sea! Emerald waters and golden sand! During summertime there are plenty of lilies, the flowers which prefer coasts like these. In Greece are called “lilies of the sea” or “lilies of Panagia (Virgin Mary)” because they bloom in August and on August 15th is the big holiday of Panagia. We admire them, but we don’t cut them; they are integral element of the environment. The two bays have a lot to tell about sea-fights and pirate assaults. Their coasts and the caves on their capes hide stories and secrets from old times. The Sarakeniko bay was always one of the best anchorages in Mediterranean Sea and the sea strait between Elafonisos and Kythera an important passage for the ships. The western coast of Elafonisos is beautiful, too. From the port the road leads to the Islands of Panagia beach, so called because of the four islands in front of it and the church dedicated to Panagia in the region. There is also the settlement of Kato Nessi. The sandy beach is long, adorned with sea-cedars to the interior. During springtime and June is full of flowers. On August 15th, holiday of Panagia, a big festival takes place. According to the custom, the boats of the island transport the worshipers free of coast. There is another beach on the southwestern edge of the island; small, the only one with pebbles, hidden opposite the islet Aelyphtes. The approaching is not easy. By boat we have to be careful because there are shallow points. By foot, starting from the village Kato Nessi, it is tiring, but worth-while exploring. Events Feast of Saint Spyridon, the patron saint of Elafonisos, December 12. Three days of celebrations, Anniversaries & Opening of St. Spyridon church, 6-9 July. Fishermen's Feast, the last ten days of August.